KeyApps is the market leader in delivering native mobile apps exclusively for recruitment agencies worldwide. With expert understanding of both the sales and recruitment industries, our team of dedicated professionals will manage everything from your initial consultation to the app going live. "We quickly realised that our candidates are very busy people with hectic schedules; it therefore became quite apparent that giving our candidates an easy to use app that allowed locum doctors to search jobs and update their availability in the palm of their hands was a ‘must have’ service offering for a medical recruiter. We chose KeyApps as our developers as they are specialists in developing Apps for the recruitment sector in the UK, and our Account Manager, John Edwards really took the time to understand our needs. I believe the App we have produced will save our candidates a great deal of time by making the management of their availability for locum work much easier and at the same allow them to access 1000’s of jobs at their fingertips." "The app is well designed and simple to use. I've never had any problems with bugs or freezing either so five stars." "Keyapps have developed a great app for me, it is an evolution and they are helpful and prompt to get back if I have any concerns. I can certainly recommend them." "Advancing Mobile Technology has offered HRS an opportunity to secure actively ‘mobile’ professionals ahead of the competition. We identified KeyApps as the outstanding performer of delivering mobile app solutions for the recruitment industry, and felt working with them would certainly enhance Hyper Recruitment Solutions’ mobile presence now and in the future! I look forward to seeing how much of an impact the HRS application will make." "Bolashak engaged KeyApps to build our Mobile Job Application software early this year. Given that smart phone usage is currently close to 50% of the population and increasing, having a mobile job application app was a logical step, and should be for any forward thinking recruitment business. The reason we chose KeyApps was twofold, firstly they offered a standalone App that links in to your existing Software, unlike many others on the market. Secondly, the development could be tailored to suit our requirements, and that was important to us as we run a very geographically focussed business. From development through to the on-going support and upgrades the service has been first class. No question or query ever goes un answered and KeyApps have listened and developed the App to our brief within budget, timeframe and delivered a great product. I would highly recommend talking to KeyApps if you are looking for a great product that can be tailored to suit your business." "The Graduate Jobs app has been a game changer for 1st Place, putting us in the hands of the candidates we really want to communicate with. Graduates tell us that it’s easy to use and that they prefer the app to applying via a desktop and that it’s also easy to share with friends looking for work. As a business, we now have the edge on the competition and better candidates to put into our 4 stage assessment process. All this has resulted in an excellent H1 and contributed to significant growth for us." "The app is a great way for me to stay in touch with a range of candidates – there are obviously people we work with on a daily basis, but it is all too easy to lose track of someone on long-term assignment. By channelling the roles I am recruiting for to a candidate pool that has opted in for those particular curriculum or subject areas makes the app such a powerful tool for me." "We took the decision to add an app to our recruitment activity because we felt it was the right tool to allow us to engage with candidates over the longer lead times which are a natural part of education recruitment. When we approached KeyApps we were delighted to discover that they shared our belief that recruitment and recruitment tools need to engage candidates in a holistic fashion and that just providing a stream of vacancies is not enough to make people stick with you through the entire recruitment process." "MP Locums has nurtured excellent relationships with our locum doctors over the years and we are dedicated to providing them with level of service that makes us their first choice when looking for work. Asking KeyApps to develop an industry leading app for our doctors has taken our commitment to a new level. KeyApps have seamlessly integrated our new app with our recruitment software and website meaning our doctors can access the jobs they want, when they want, at the right location and grade for them – all on the move. Fabulous result all round KeyApps and you have been a joy to work with. Having been delighted with the work on the App we asked KeyApps to redesign our website. Their creativity, insight and patience has given us a brand new website we are thrilled with. An excellent job and whilst the KeyApps team are always professional in their approach they are very approachable and their practical advice and can-do attitude has made the transition to our new website far easier than I had thought it would be. From the app development and integration to the new website KeyApps have been a pleasure to deal with. They don’t stand still though and we know they have some exciting ideas going forward for our app and we are very much looking forward to working with them again soon." "From our first meeting John accurately noted my requirements. We wanted a cutting edge, slick, professional looking website although had no idea of where to start, not enough spare time to input and no in house capabilities to provide any real detailed brief. John throughout the whole lifecycle was indeed a great help and showed first class management skills. From listening to our requirements, advising and making constructive suggestions where required, John and his team ensured we were working together throughout and was always available and reacted quickly with amendments and alterations of which we required many. John kept us fully aware of development stages and completed the project well within the expected timeframes. The site is now live and is one we are really pleased and proud of. The working relationship with John has continued and he is still on hand to help, support and advise for future development projects including the TDA App which we are really excited about. I would highly recommend John and the team at KeyApps as an excellent partner for Web and App Development." "This app is so simple but has literally everything you need. Clever." "Working with KeyApps, Spencer Ogden have developed an industry-leading app which brings together all the energy sectors allowing users to easily search and apply to jobs relevant to them. 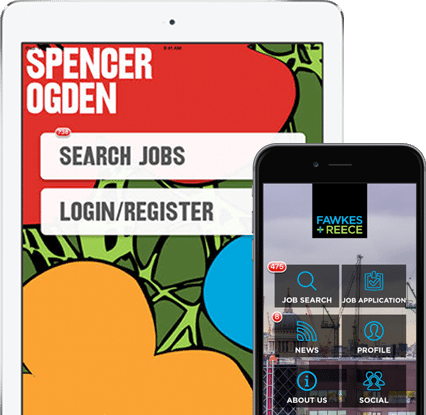 The Spencer Ogden Jobs App has now become an integral part of our recruitment strategy with many of our placements coming from in app applications and huge download numbers from all over the world across multiple devices." "As a company who pride themselves on being at the forefront of innovation we approached KeyApps to take our recruitment process and brand to the next level of mobile technology. They exceeded our expectations with a market leading app which will enable us to engage a wider candidate base enabling them to apply for jobs anywhere, anytime. A knowledgeable, professional and creative outfit, KeyApps never lost sight of Spencer Ogden's core objectives whilst providing their own expertise and insight. KeyApps’ greatest strengths are how effortlessly they integrated into all our existing software and their continued efforts to develop their technology to stay at the forefront of mobile application technology. I would highly recommend their services, but maybe not to our competitors."